Last week I shared some living room inspiration with you all and I wanted to come back today with the bedroom inspo! I have had a clear vision for this room since before I even thought about moving. Unlike our living room where everything is pretty much staying, our entire bedroom is changing except for the headboard which is studded and I love!! Everything else is going to be new!! We both really want the space to be relaxing & calming so the colors are going to be very muted...with a few pops here and there. Without a doubt I wanted to have campaign nightstands - I just love how clean they look and found a great deal on Overstock. I ended up deciding on the grey ones, even though I really wanted the white - but apparently so did everyone else because they were sold out everywhere. I really like that there is less storage (for once since I always want more storage) because this will force me (us) to keep the tops uncluttered! We've had our headboard for almost as long as we've lived in our current place and I still love it. It's exactly like the first inspiration photo. I love the look of white furniture, probably because I've had wood furniture my entire life - so I'm ready for a change and my husband is thankfully going along with my vision. We went to Ikea and scoped out a few things and decided to go with the Hemnes line. I'm going to be switching out the hardware similar to the photo above - just changing out the hardware makes the piece look luxe. I'm also tempted to finally have a full length floor mirror in our room. As much as I would love to have all white sheets - I know myself and I just wont be able to keep it crisp and clean and that would drive me crazy. I am hoping to find an in between and something that makes me feel like I'm sleeping in a hotel bed every night - the sheets and bedding that feel like clouds! This is actually going to be the first time since I lived with my parents, that I won't have a television in my room and I'm looking forward to it. Since we are going to have a second room, that's going to going to house the second TV, unless I seriously can't live without it in our room and we move it haha! I think it'll be nice to not have to decorate around that in our room for once! Where I think I can bring some color into the room is with art pieces. Right now we have a canvas from our wedding day in our room, but I'm planning on building out a gallery wall in the hall where that will go, so I'm looking to add maybe one statement piece or a few little ones around the room. So there's a look into what I'm planning. Where do you like to shop for bedding? What are your favorite colors for the bedroom? Our bedroom is a mix of muted grey/blues and other shades of grey and I love it. The wall behind the bed is a grey and the other 3 are more of a blue, I always love not only an accent piece but an accent wall. Plus, I must have matching side tables and lamps, I'm type A that way, lol. I have no doubt your home is going to be magnificent!! LOVE all of this inspo! Everything is so bright and airy. I want a studded headboard SO bad, but I'm particular about what I want. I go back and forth between styles too...in our last house our room was very "glam"...purples, blacks and grays were the colors. Black furniture, a beautiful damask black and white comforter and a few silver wall elements...so for our next house I'm not sure if I want to stick to that or go a more neutral route...it's SO hard! I bet you are having so much fun with all of this! I LOVE the nightstands. It's going to be SO FAB! We tried the whole not having a TV in the bed room thing when we moved into our house annnnd it didn't last. But maybe you will be better than us :) LOVE those nightstands!! I am dying over all of these pictures! Great inspiration indeed. I cannot wait to see it all come together! I love white furniture too!! 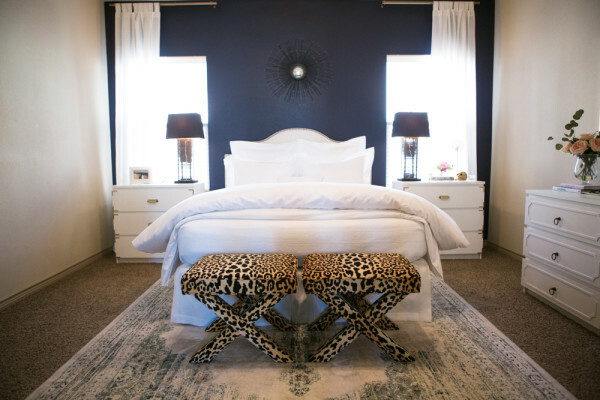 And I'm obsessed with those little leopard ottomans at the end of the bed--how adorable! GORGEOUS inspiration, lady. Totally up my alley, love, love all the calm and serene touches. I think art is the perfect way to add some color, or pictures from some of your travels around the world. 100% with you on the sheets, btw. I love those nightstand tables! Everything with the white just feels airy and dreamlike! Wall art and decorative pillows are where you can pull in some color for sure. Or a colorful throw! Great inspo! Love the light and clean lines. Love all these looks.. you can never go wrong with neutrals! Love the black accents. I'm obsessed with those night stands!! We are trying to redecorate our room but just cannot decide on the furniture yet haha. I want an upholstered headboard but then we don't know where to go from there! Beautiful inspiration. Our bedroom is black and white with gold accents. I'm working on adding more gold here and there, and could do that through hardware--thanks for mentioning that :) I can't wait to see yours finished! Ohh I love the art work inspiration you've picked! I always forget how easy it is to change out hardware on things and it can make pieces look completely new! I love all this inspiration! Great idea to bring color into the room with pictures, I love that idea! I would also have to agree with the white sheets. My mom has white sheets in my room at my parents house and it's super hard to keep them clean and crisp. Especially with my husband haha! Yes! To the hemnes line it looks sooo beautiful and when Sophie is older I'm definitely planning on getting it! I, of course, love how the white looks which is why I'm waiting so it doesn't get stained. Loving all this bedroom inspiration! Right now I am on the hunt for some new table side lamps so this is right up my alley. I love the ideas for your new bedroom! We're going for a similar feel, more relaxing and calming. I also love the look of a full length mirror, it can make the space appear larger and luxe! Speaking of luxe, I love the white furniture you went with and how you'll be chaining up the hardware! Keep an eye out at HomeGoods because sometimes, they have them there! Thanks so much for sharing, beauty, and I hope you're having the best week so far! The campaign stands will look so good with your headboard - loving all your inspiration! I love your picks! I'm always pinning bedroom decoration inspiration but now I really need to get around it doing it! I love a muted bedroom with pops of color. I tend to keep mine to our pillows so that I can easily switch them out. Abalone by Benjamin Moore is the perfect light gray for a bedroom, too! And switching out the pulls on the Hemnes line is definitely the way to go! Love all of your inspiration! Studded headboards are so gorgeous and I just love white furniture!!! Our main color in our bedroom is gray and I have little pops of purple in the throw pillows, candles and art. I love white bedding as well, but like you....there is just no way I could make it work for me! Check out the hotel collection duvet covers and sheets from Macy's -- they are delectable! 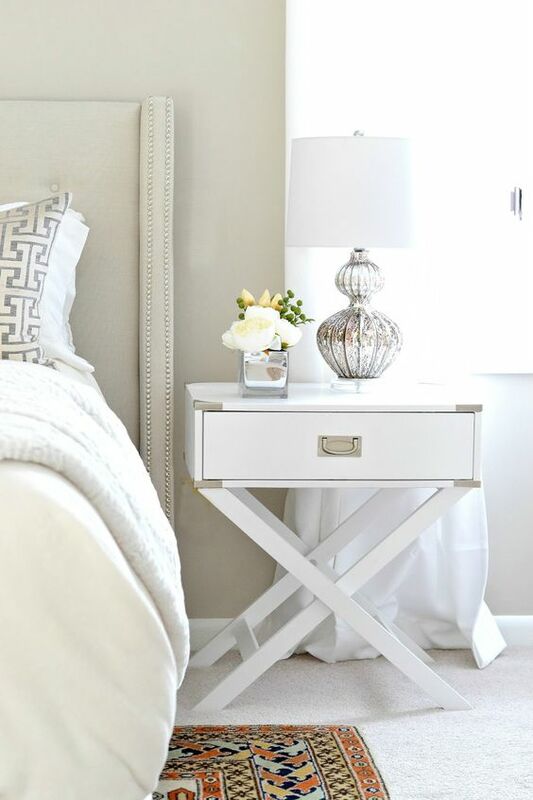 Love the nightstands and the hardware change out on the dresser!! It's going to be GORG! So fun and exciting! I just went back and saw that you guys are moving, how exciting and congrats to you guys!! I love your bedroom inspiration! The pops of color with the art is so perfect and will add a personal touch. Also, I'm the same way about crisp white sheets, it won't stay that way and it'll bug me too much. Maybe another neutral color would work well? Congrats on the new place! And absolutely LOVE the inspiration- can't wait to see how it all comes together! Seriously obsessed with it all!! 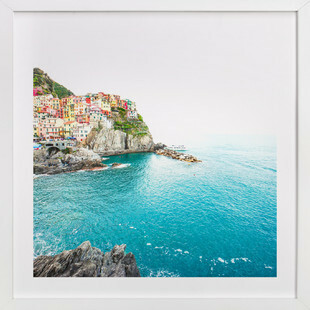 I love those Minted prints :) Happy decorating!! 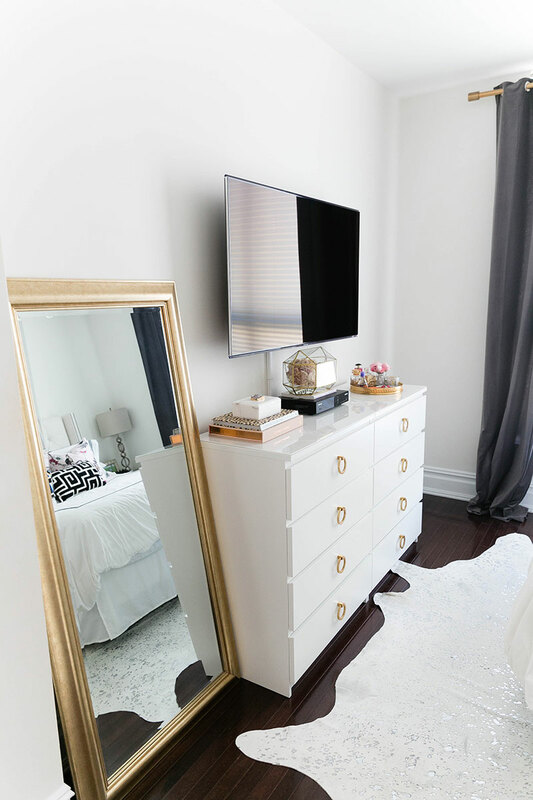 I've always loved white furniture and I love that gold mirror propped up! And of course the leopard ottomans at the end of the bed! Decorating can be such fun! I love the simple clean bedrooms. Sadly, but not really, we'll never have that with dogs. I keep my colors neutral due to muddy feet tropping through all through the night & dog toys laying everywhere :) haha ... white sheets & white bedding? I'd be washing it at least 3 times a day in my house. But I LOVE the look. I love those side tables!!! Loving your inspiration. That is a great ikea hack! I like neutral with pops of color as well. I bought a headboard like yours when I moved to Austin and it never came and I never got another one, I need to! I cannot recommend comphy sheets enough https://www.comphy.com/bed-bath-products/luxury-bed-sheet-set They are worth the investment. So cool in the heat and comfortable in the winter. I have the gray and it is so pretty. They are very stain resistant so you may be able to do white in them. The ex loved them so much he tried to steal them from me when we broke up! Ooh I love it all! I am so excited to see what you do with the room, girl! Your inspiration is making me want to redo mine! Haha. I do love those nightstands. I have had the hardest time finding the perfect ones for our master bedroom and we have been in our house for two years! Black & gold for the win! The art pieces are to die for - and that propped mirror! So dreamy! I agree muted colors look really cozy for bedrooms. I'm a fan of grey and white, although as you said, white isn't very practical. Love the vision you have and the inspiration you found to build out your perfect bedroom. I'm with you on wanting the bedroom to be a nice and calm place to be able to relax, and your inspiration definitely fits that! I'm a huge Pottery Barn fan, and all of the sheets and bedding that we've bought over the years from there has been wonderful! LOVE your inspiration! Those tables are super cute - I can totally see your whole vision. It's going to be so pretty! Gorgeous inspo!! I love the sleek glam look of black and gold. I love the artwork! Very inspiring. And I'm with you on no TV. I haven't had a TV in my room since I was in high school and I've never missed it. I'm loooving the crisp black and white and neutrals theme you have going on here - so serene and perfect for a bedroom! We just got a full length mirror in our bedroom last week and I'm SO obsessed with it! Definitely recommend one! Love love love all of this inspo! The greys and whites are so pretty and I love a good pop of leopard! Great inspiration! I choose not to have a TV in bedroom years ago. It feels good now since I fall asleep in a dark room. I did had my change in design and the color I choose was white with natural wood around. New to your blog and your bedroom inspiration is definitely the kind of bedroom I would want...! Gorgeous!! And your headboard looks fab!! Your new place is going to be so pretty! I love campaign furniture! Love your inspiration! I'm going to have to check out that Ikea line when we move! The biggest thing I want is a new bed frame and headboard, but first we need to have a guest room to put my old bed in! Each look is so chic/and beautiful-I take each room-but you're right changing the hardware is a quick room update-I did that last summer. I have that white Hemnes dresser in my daughter's room. We also swapped out the handles for fun purple crystal ones that go with her decor. Even though it is an inexpensive piece - it is not a cheap piece at all. It is made really well and the drawers are very roomy! You should definitely get it! Your bedroom is going to be so beautiful! I've been struggling with how I want ours to look, I'm with you on the white furniture. We had a black set before, so I'm ready to see some light!! we don't have a TV in our room and it's the best. neither of us grew up with one (i got one when i was 18 or so but still living at home) and i love that our bedroom is tv free. we didn't have a second tv until earlier this year and i'm not gonna lie, i love that we have a second tv now hahaha. it's in our spare, and sometimes i fall asleep in that room with the tv on so... i'm a hypocrite. lol. i love the Hemnes line and would love to replace our furniture with that. i got a gorgeous full length mirror from tj maxx or homegoods i think, love it so much! Nice finds, I love the decor with the tv, any one of these would make an awesome bedroom. Love your inspiration photos!! I have been on the hunt for the same type of white nightstands and seriously.... nowhere. Well.... places, but out of my budget :) I have the Hemnes Ikea Dressers (the large you have pictured and also a smaller one) and I seriously LOVE them. And changing the hardware out if you want to is so easy to change up the look!! Cant wait to see what it looks like! never mind sorry j! ust saw your hardware inspo and love it! So pretty and cozy pieces for a bedroom! I'm almost complete decorating mine but one of those gorgeous tufted benches for the foot of our bed is on my wishlist. So much inspiration. 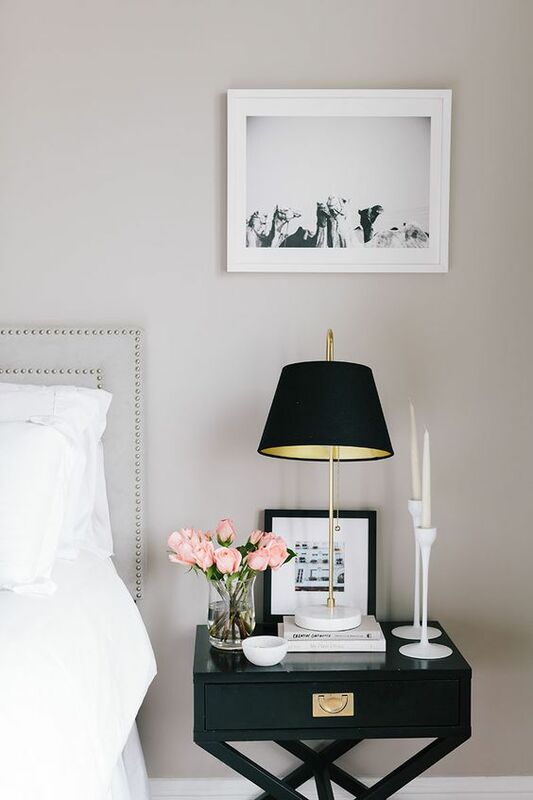 I love the muted, pastel clean look in a bedroom. White furniture is the way to go. And I need a full body mirror myself. When do you guys move to the new house? I cannot wait to see how you decorate it. P.S. Great idea not having a TV in the bedroom. I love all your ideas for your bedroom. I think white is so pretty and luxurious. I would love to one day have white furniture. I have dark wood right now so it would be quite different. I didn't have a TV in my room for the longest time. I finally caved when I had some house guests for a while and wanted to just chill in my room before going to sleep. It was nice not having a tv in my room and honestly didn't bother me. 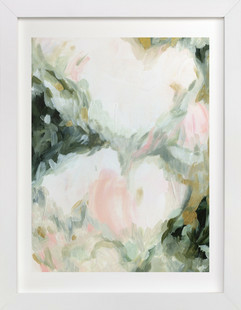 I have seen some really gorgeous wall art on Etsy. There is this one artist that makes pieces that are 3 metal panels. My friend got a tree painting and it spans across all 3 pieces. It is really pretty and not too expensive.